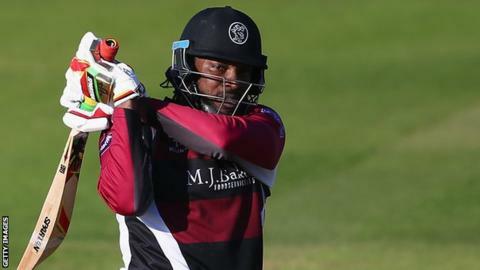 Somerset's West Indies star Chris Gayle is to miss the T20 Blast match against Glamorgan on Saturday and return home early because of an "immense workload". Gayle's final game will now be Friday's game against Surrey in Taunton. The 35-year-old has scored 328 runs in three T20 Blast matches for Somerset, including 151 not out against Kent. "Although slightly disappointed, his contribution to Somerset CCC during his stay has been immense," said Somerset director of cricket Matt Maynard.